Norwegians are stereotyped to all have blue eyes and blonde hair, but more than 3% of the population are Muslim, mostly immigrants and living in Oslo and nearby Akershus. The majority of these are of Pakistani descent. Norway’s Muslim population has grown in recent years but so too has negative media coverage. Events such as 9/11 and the Madrid and London bombings have been reported in a way that communicates a troubling message; Islamic extremism. Such attitudes were starting to feed through to the mainstream native Norwegian population and a silent but growing mental gap was being created between the two communities. Most troubling of all, this gap was creating space for the rise of extreme right wing politics with potentially damaging consequences. A two-part strategy was developed to organise tea parties across the nation whilst building awareness of the event among citizens who couldn’t participate. Firstly, the centre worked closely with Muslim community groups and leaders to sign up an army of inviters ready to welcome Norwegians into their homes. It then focused on promoting the message to those citizens who couldn’t participate. To maximise PR coverage, the Anti-Racism Centre reached out to high-profile citizens and the Royal family to invite them to attend events and ensure that key media covered the Muslim community’s determined efforts. Since this was a social invitation, it leveraged Facebook as the main networker, connecting those who wanted to be invited with the hosts of the open homes. Invites were also sent to locals near the open houses to ensure that as many people as possible got the chance to meet their Muslim neighbours. The initiative was adopted by Muslim communities across the country, extending the reach of the campaign significantly. The official tea parties opened up more than 200 homes to over 1,000 Norwegians. Local initiatives ensured that there were more than 300 events in the first month alone. The Queen took tea with a Muslim family and media coverage lasted several days, including national and local press as well as major TV news bulletins. 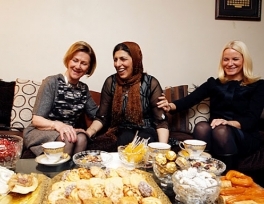 As a result of the campaign, the Norwegian government helped fund the Anti-Racism Centre to organise and administer tea parties, ensuring on-going contact between the two communities. Research showed that negative attitudes to Muslims declined and the number of people who agreed with statements like “Muslims are not interested in dialogue” and “Muslims do not like Norwegian Culture” fell by 40%. Four in 10 South Sudanese need aid but violence blocks access - U.N.